Jennie Avila is a Smithsonian Fast Folk Artist and has eight recordings to her credit. A documentary about her life was featured on Art Beat. She is a Wolf Trap Teaching Artist, and returns annually to the Philadelphia area to present song writing workshops for Young Writers Day and the New Jersey Teen Arts Festival. As a touring performer with international airplay, Jennie has inspired rave reviews from fans and music industry peers. 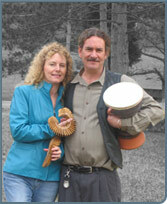 Jennie has graced the stage at the Philadelphia Folk Festival, the Boston Folk Festival and Appel Farm Festival. She is also a member of the popular Maryland based trio, Hot Soup. A featured artist in Barry Hall’s new book, “From Mud To Music”, Stephen Wright has established himself as a premier drum maker. His masterpiece instruments are played by top percussionists around the world. Many fans recall his rock solid drumming for the band, The Blue Comets. 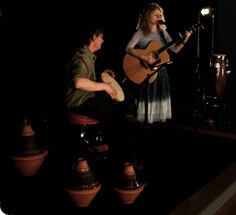 In the duo, Aca-Perco, Stephen interweaves rhythmic soundscapes to enhance Jennie’s compositions. It is a double treat to hear the ceramic artist perform on his own works of art.